This is our One Minute Monday blog - where, once a week, we outline a fact from our research in under 60 seconds! The health and social care sector is one of the largest in the UK, employing over 4 million people. But what are its challenges? In our report we highlight that the main challenges to the sector are challenges of changing demand. By 2020 the UK population is estimated to increase by 7%. This increase in population is likely to put a strain on the health and social care sector, especially when you consider the demographic changes it implies. By 2027 it is predicted that there will be 2.4 million people in the UK aged over 85, an increase in a million from 2012. 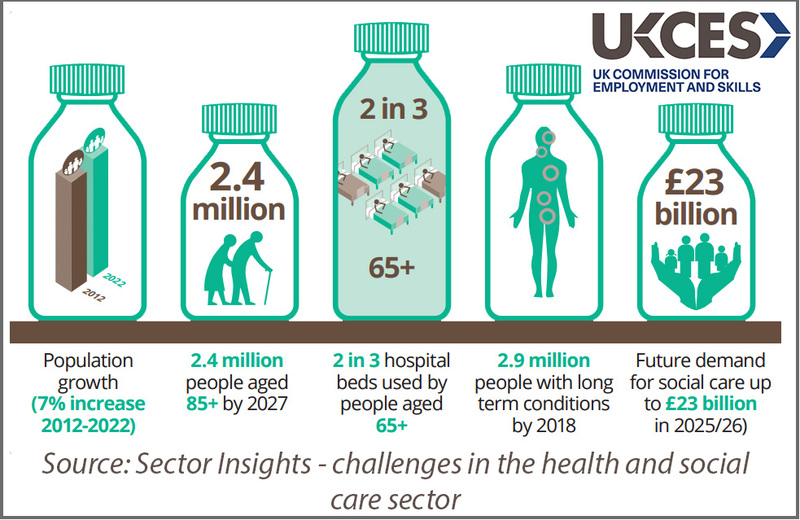 This ageing population is correlated with increases in demand for the health and social care sector. For instance, largely due to ageing population, it is predicted that people experiencing multiple long-term conditions will go up by a million by 2018. Similarly demand for hospital bed places and residential care services will increase as the population ages. How should the sector respond to these changes? What other challenges does the sector face? How will these changes effect particular professions within the industry? Find out all this and more in our full report. If you want to know more about our Sector Insights reports or have questions about this post, tweet us @ukces or leave a comment below. A poor prognosis for skills in health and social care?